A mixed month for global bond markets. Comments from the Federal Reserve in the USA emphasized their confidence in the US economy. However, weaker equity markets stopped US bond yields reaching new highs. In Australia, the CPI data supported the view that the RBA will remain on hold in the near term. This resulted in a positive month for Australian bond investors. The US 10-year bond ended the month at 3.14% with an intra-month high of 3.23%. This compares with a closing level in September of 3.06%. For the US market, the future effects of trade wars and higher short term interest rates continue to be considered. This is despite a strong US economy and low unemployment data. Equities focused on the downside risks and the S&P 500 closed down 6.90% for the month. Bonds benefited from a flight to safety and kept within in the current trading range that we have discussed previously. This trading range, with yields reaching a high of 3.23%, will be broken. However, we expect yields to be around 3.25% at year-end. But, the yield cannot accelerate beyond 3.50% if there are concerns around the equity market. We still expect another 0.25% increase by the Federal Reserve in December subject to the equity markets not falling further than 10% from current levels. The RBA remains on hold. The RBA Cash Rate for December 2019 was indicating 1.61%, down 0.05% from the end of September. Many commentators are calling for RBA rates to be on hold until 2020. The CPI numbers printed at the month end showed a benign QoQ + 0.4% and YoY + 1.9%. It should be noted that the RBA is expecting inflation to remain within its 2-3% target range. The 10-year Australian bond finished 4bps lower in yield at 2.63% with higher prices. Australian bonds managed a small drop in yields even though the US 10 year bond increased in yield. What about corporate bonds and BBSW? Credit spreads, or the premium required to hold a corporate bond instead of a government bond, were slightly higher. However, the change in premium was small enough that corporate bonds generally outperformed government bonds. The higher yield of corporate bonds gives them the capacity to have slightly negative changes in risk premium and still outperform their equivalent government bonds. 3 month BBSW was lower moving from 1.94% to 1.91%. As we have discussed, the new levels of BBSW are starting to reflect in higher borrowing rates from bank customers. This is putting a constraint on the economy even though the RBA is not changing its official rate. The Bloomberg AusBond Composite Index for all maturities (the common benchmark) produced a positive return of 0.48% for the month reflecting lower yields (higher prices). The Treasury Index (government bonds) for all maturities which is the single largest contributor to the composite index produced a positive return of 0.50%. The Credit Index (corporate bonds) for all maturities produced a smaller positive return of 0.48%. This reflects the fact that government bonds have a greater weighting in longer dated bonds. 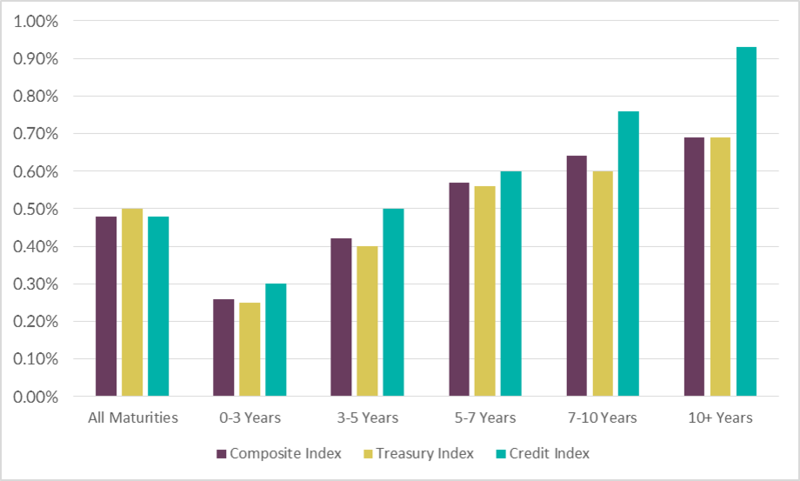 When comparing corporate bonds to government bonds of the same maturity, corporate bonds slightly outperformed their government equivalents as defined by the sub-indexes above. While the Credit Index for 0-3 year bonds produced a 0.30% return. The information in this article is general in nature. It should not be the sole source of information. It does not take into account the investment objectives or circumstances of any particular investor. You should consider, with or without advice from a professional adviser, whether an investment is appropriate to your circumstances. Australian Corporate Bond Company Limited is the Securities Manager of XTBs and will earn fees in connection with an investment in XTBs.